Top leaders of Vietnam and Cambodia have exchanged letters of congratulations on the 50th founding anniversary of diplomatic relations (June 24) and the Vietnam-Cambodia Friendship Year 2017. Party General Secretary Nguyen Phu Trong and President Tran Dai Quang sent congratulatory letters to Cambodian King Norodom Sihamoni. Prime Minister Nguyen Xuan Phuc sent a letter of congratulations to his Cambodian counterpart Samdech Techo Hun Sen. Meanwhile, National Assembly Chairwoman Nguyen Thi Kim Ngan extended congratulations to Senate President Samdech Say Chhum and National Assembly President Samdech Heng Samrin of Cambodia. 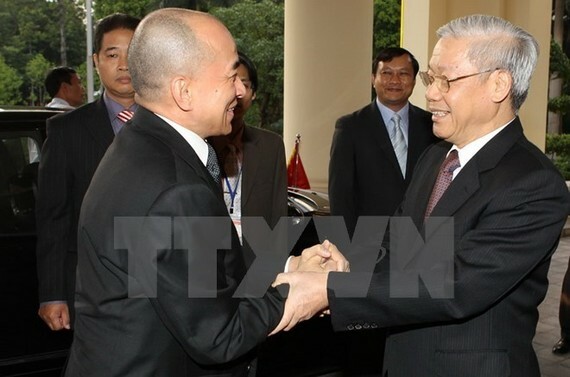 The Vietnamese leaders expressed their delight at the continually sound development of Vietnam-Cambodia relations over the past five decades. They affirmed that despite difficulties and challenges, the people of the two nations have always been united together, stood side by side and given each other disinterested and pure support and assistance during their struggles for national liberation in the past as well as the process of national construction and development at present. This is an invaluable and sacred asset of the two nations that needs to be further maintained and consolidated, they said, expressing their belief that the good neighbourliness, traditional friendship, comprehensive cooperation and long-term sustainability between Vietnam and Cambodia will continue to be solidified and developed for the sake of their people, as well as for peace, stability, cooperation and development in the region and the world. Meanwhile, King Norodom Sihamoni also extended letters of congratulations to Party General Secretary Nguyen Phu Trong and President Tran Dai Quang. Cambodian Prime Minister Samdech Techo Hun Sen sent a congratulatory letter to his Vietnamese counterpart Nguyen Xuan Phuc. 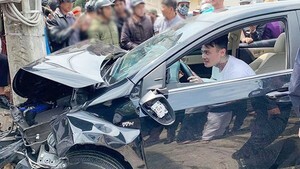 Senate President Samdech Say Chhum and National Assembly President Samdech Heng Samrin sent congratulatory letters to National Assembly Chairwoman Nguyen Thi Kim Ngan. In their letters, the Cambodian leaders expressed their admiration for the great achievements that the Vietnamese people have obtained under the leadership of the Communist Party of Vietnam. They wished the Vietnamese people will successfully accomplish the industrialisation and modernisation process and affirmed that Cambodia will forever keep in mind the Vietnamese people’s assistance and sacrifice in the liberation of the Cambodian people from the genocidal disaster. On this occasion, Vietnamese Deputy Prime Minister and Foreign Minister Pham Binh Minh and Cambodia’s Senior Minister and Minister of Foreign Affairs and International Cooperation Prak Sokhonn also exchanged congratulatory letters.